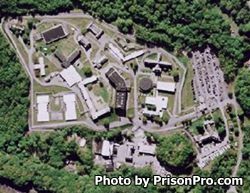 Bedford Hills Correctional Facility is located in Westchester County New York. It is a maximum security prison that houses adult females. The current capacity of Bedford Hills is 972 inmates. The facility has over 180 security cameras with audio and video capabilities. The facility prides itself on it family centric programs. Prison Industries offered at Bedford Hills Correctional Facility include a telephone customer service center for the New York State Department of Motor Vehicles. Vocational training in cosmetology, horticulture, business, printing, dog training, and computer technologies is offered to eligible inmates. Inmates can also receive alcohol and substance abuse treatment. Additional programs offered at Bedford Hills Correctional Facility include alternative for violence, family reunion program, rehabilitation through the arts and more. Visiting is 8:30am-3:30pm Monday through Friday Weekend visits are on a alternating schedule that goes by the first letter of the inmate's last name, hours of visiting on the weekends are 8:30am-3:30pm. Processing for visitation ends at 3pm, if you arrive after 3pm you will not be admitted to visitation. On weekdays inmates can have up to four visitors (children do not count), weekend visits are limited to two adults (unlimited children). Inmates who are still Reception Status or have been at the facility for less than 30 days are only allowed weekend visits.